In our August/September issue, we ran the article “Exceed Your Marathon Goals – by Running a Half First.” As I train for my first marathon, I am taking any advice I can get, and after hearing from the experts quoted in this story, I was convinced to sign up for one. When looking at half marathons in the area for late August and early September, I definitely wanted to pick a weekend that correlated with a “cut-back” week on my training plan, so not to skip an important long run with my group. 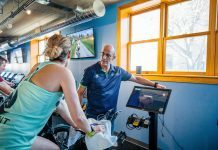 When I discovered the Strider Half Marathon, hosted by the Badgerland Striders, a Wisconsin running group, I was interested; I had heard good things about the group’s other events, and have never ran in Milwaukee, so thought it would be a cool experience. In fact, the only halves I have done have all been in downtown Chicago, so I knew this race was going to be a good change of pace (pun intended). With the Chicago Triathlon also occurring this weekend, I decided to make my trip to Milwaukee short and sweet. I drove up early Saturday morning, and with no traffic on 94, got to Estabrook Park around 7 a.m., leaving me just enough time to pick up my bib and shirt, and get ready for the race start at 8 a.m. Although humidity was high, Milwaukee was graced with overcast skies for much of the morning. The entire course was in Estabrook Park, meaning 80 percent of it was shaded by trees – something that I really welcomed in that most Chicago half marathon courses don’t have this luxury. The first four miles were a loop around the beer garden, which is a permanent and awesome feature of the park, and then we embarked on an out-and-back on Oak Leaf Bike Trail. Typically, an out and back longer than five miles total seems daunting to me, but because this park is so pretty, it honestly flew by. Plus, the path was kept open to the public, who were all supportive spectators as they ran or biked themselves. Overall, I loved the course. The entire thing was paved and flat, making it easy to pick up the pace when needed. My goal was to break two hours, as I never had before, and despite my first few miles being slower due to some expected congestion on the route, I was able to strategize each mile and hit my goal! I honestly picked the perfect course for a PR. 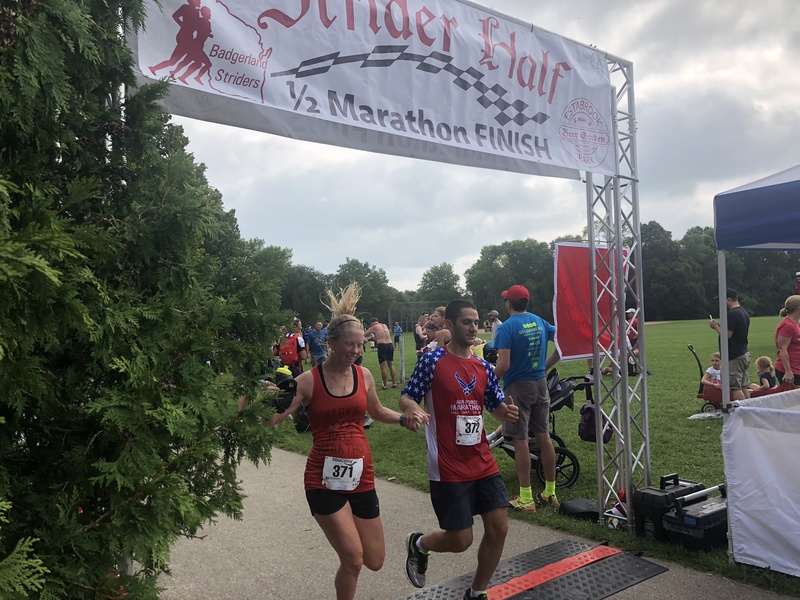 After the race, Estabrook Park opened its beer garden up early for the event, and runners got to enjoy beer and a full breakfast provided by Badgerland Striders. One may think that with a course this nice in a public park, a full breakfast and bar available, and a tech shirt and cool medal given to all runners, that registration would have been expensive – it was only $42! And Badgerland Striders members only paid $28. For someone used to Chicago’s race fees, this is unheard of, and much appreciated. I got a chance to talk to both the race director Tom Buthod and the Badgerland Striders President Pete Abraham, and they said that they like to make their events about camaraderie; while they do get fierce competition at their 19 events throughout the year, the focus is always a fun, affordable and accessible race. No wonder the Badgerland Striders have been around for 59 years. Overall, I had a great experience at my first Milwaukee race; most of the club’s events are within driving distance from Chicago, so I highly recommend participating in the Badgerland Strider events. I definitely will be, as I now have the official club jersey too. Congratulations on a well deserved PR! I’m still dreaming of that sub 2 hour half. Sounds like you had decent weather conditions given that it is August in the Midwest. Can’t wait for your marathon report!